Mick Fanning and Kelly Slater came into the Billabong Pro Tahiti sitting 1-2 in the standings, with each surfer looking to separate himself from the pack to kick off the second half of the season. And while each of the former world champs surfed well, each fell victim to a red-hot Ace Buchan in succession in the semis and finals, as Ace picked up his second WCT win ever, and first since 2008. Slater faced off against last year's champ Joel Parkinson in a round 5 elimination heat that you could just feel how badly each surfer wanted to win. 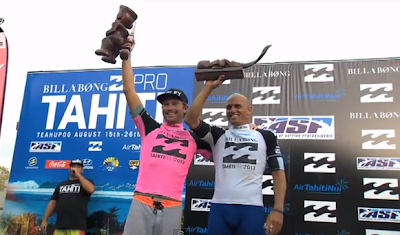 Slater, known for playing mind games with other competitors, paddled right up to Parko at the beginning of the heat and gave him a "good luck" handshake. But luck was on Kelly's side, and he sent Parko packing. Kelly then handled Fred Patacchia in the quarters, doubling him up 16.86 to 8.66, in what he called afterward a "workmanlike" heat. Although it wasn't always pretty, Mick Fanning continued his impressive streak this season of reaching the quarterfinals in every event. He won a couple "survival" type heats to stay neck and neck in the overall standings with Slater. Sitting on a 12.07 to 7.06 lead in the quarters against Josh Kerr, Mick only advanced when Kerzy stood up on his last wave, a barrel that would have won him the heat, just after the buzzer. So Mick advanced to the semis, where he came up against Ace Buchan. 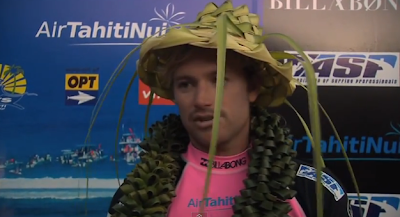 Although he was the underdog, Ace was hot, having knocked out Jordy Smith and then John John in the quarters with a 19.17 two-wave score, countering John John's double-barreled perfect 10 bomb that won John John the AI Most Committed Award. Ace continued his hot form from the first minute of the semis, combo-ing Mick early with two 9-point waves and holding him off down the stretch. The Ace-Slater final followed a similar script as Ace's semifinal win. Ace landed two 9 points rides, leaving Kelly combo-ed half way through the heat. Of course, Kelly fought back immediately with a 9 point ride of his own. As time ticked down, Kelly ripped off a rare right hand ride that earned him an 8.80, but it was just a point short of the score he needed. The WCT moves to the U.S. for the Hurley Pro Trestles, September 15-21. The Ultimate Surfboard Roof Rack!